The Denali Park Road is the only road through Denali National Park and Preserve. It’s 92 miles long and runs parallel to the magnificent Alaska Range. Private vehicles are allowed in the park but can only drive as far as the 15th mile to a place called Savage River, where there is a campground, shuttle stop and the paved road ends. The only exception to the rule is for for a limited number of winners of the Road Lottery; an annual lottery that awards a permit to 400 people to drive their private vehicles the full 92 miles. 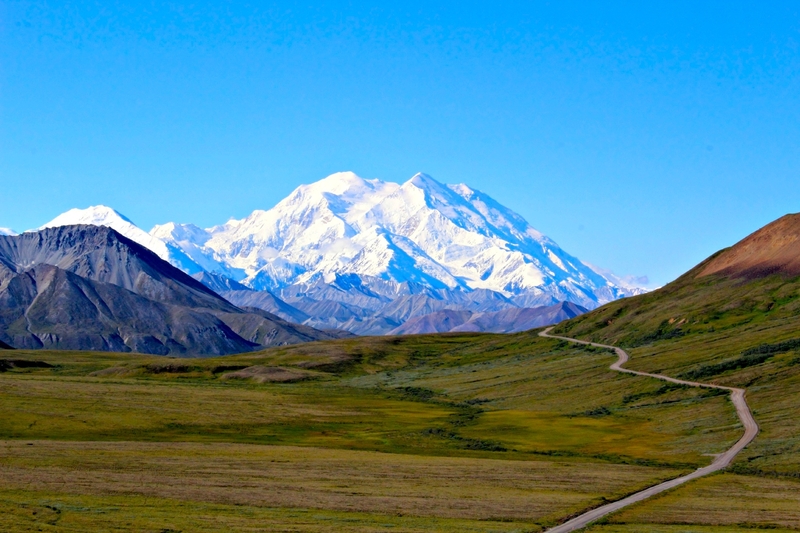 If your reason for visiting Denali is to see North America’s largest peak (Mount McKinley, also known as Denali), it is possible to see it on a good day from the 9th mile. However, I highly recommend taking a tour or shuttle bus right into the park because you will miss out on so much scenery and wildlife, if you don’t. The longer you spend in the park, the more likely you are to see wildlife. You can hop on and off the shuttle bus at various points, so you can hike and explore as much as you want too. 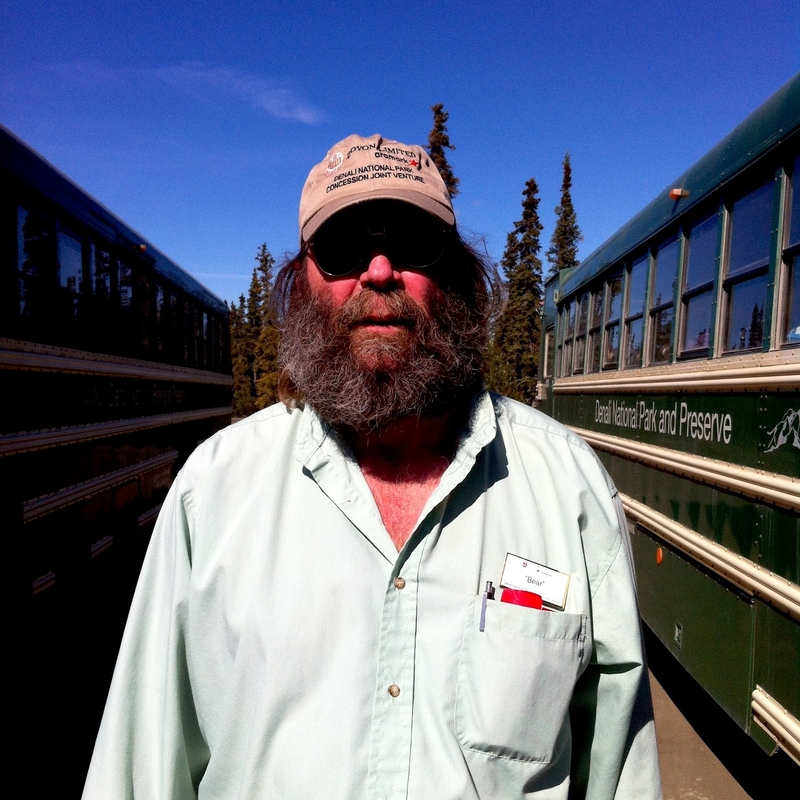 We booked the 6.30am shuttle bus from the Wilderness Access Center, at the Denali Visitor Center. At the time tickets were $35 USD each. 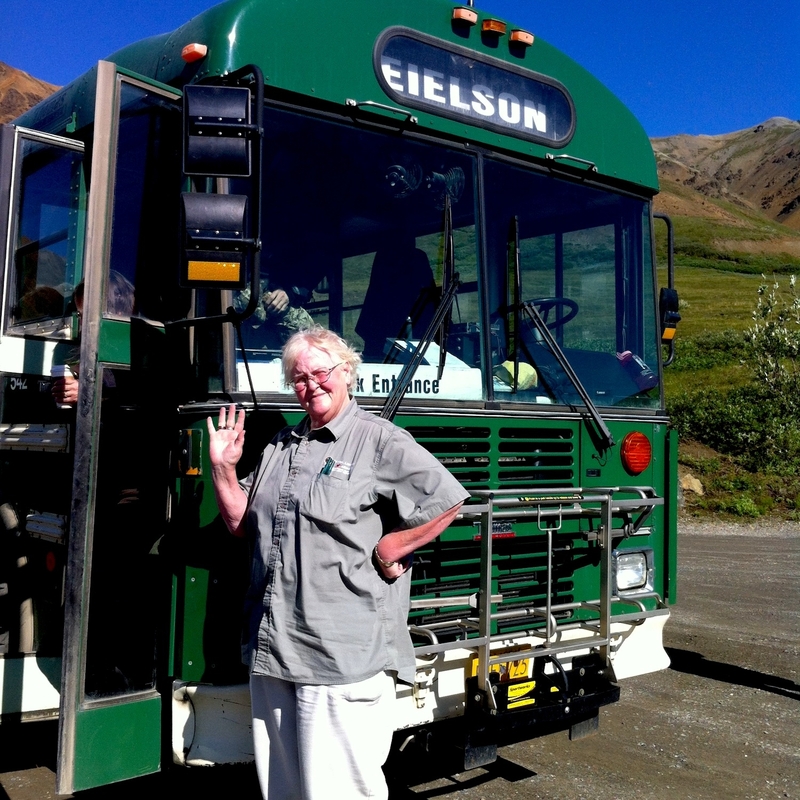 We had a long day ahead of us; the 66 miles to the Eielson Visitor Centre takes approximately 4 hours to drive. The pace is slow not only because the road is unpaved after mile 15 but also because we stopped to view wildlife whenever there was something interesting to see. This road trip is as much about the journey as it is the destination. The scenery is spectacular, especially when the weather is good; we were incredibly lucky and were greeted by clear blue skies. We were also incredibly blessed to have two fantastic shuttle bus drivers who both enjoyed providing passengers with little anecdotes and facts about the park. Eielson Visitor Center contains all the usual facilities and information you might expect at a visitor center, apart from there is nowhere to buy food and drink. This is to be expected in the middle of a designated and protected wilderness area where the Big Five (bears, moose, caribou, wolves and Dall sheep) roam free. You can however refill your water bottle. 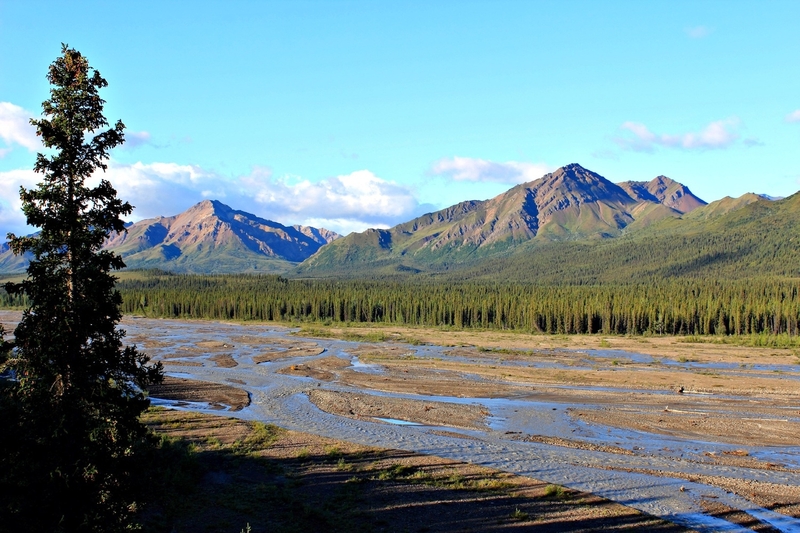 Eielson is a fantastic area in the park to visit because it provides an amazing view of Denali; I still can’t quite believe how lucky we were to have experienced this view of the mountain. We were told that typically only 30% of visitors get to see Denali’s peak and because the weather was quite poor during 2014, chances of seeing the peak were as low as 5%! There are a few options and trails for hiking around Eielson including two official trails; one is a short loop into the tundra and the second a steep hike up Thorofare Ridge. You are also welcome to hike off-trail. One of the main reasons I visited Alaska is because I love bears and Alaska is archetypal Bear Country! I was completely overwhelmed by the number of bear sightings during this one day road trip through the park. Before we reached Sable Pass on Denali Park Road I observed three blonde grizzlies, a mama bear and her cubs, low down on a mountain side, just across the tundra. We quickly spotted more grizzlies, a total of eight by the time we reached Eielson. Whilst hiking around Eielson we also spotted a grizzly, from a safe distance. A safe distance is considered a minimum of 300 yards (approximately 275 metres). My friend and I bumped into a park ranger whilst hiking the loop and she explained just how quickly a grizzly could reach us. A grizzly can run at a speed of up to 35 miles per hour; the ranger pointed to a ridge, opposite the one we were hiking on and told us it would take just 20 seconds for a grizzly to reach us. We looked back up the trail towards the Eielson Visitor Center and acknowledged that there was no way on earth we would get back to the top in 20 seconds! On our return trip to the Wilderness Access Center we continued to encounter a number of bears from the bus. Bears, like people do like to make use of trails and we also discovered one who appeared to enjoy road trips, as he strolled along Denali Park Road in front of the bus. We also saw lots of caribou and eagles, but it was the 18 grizzly bear sightings and scenery that made it for me. That road trip was well worth the 8 hour round trip! Find out the National Park rules and observe them. Know how to stay safe in the wilderness. Book your shuttle in advance and find out the schedule. Stock up on supplies and carry a water bottle that will allow plenty of water for the activity you intend to do and the time you intend to be away from facilities. Protect yourself from the sun, insects and dust; even on the bus with the windows open, it can get very dusty. Collect maps and a copy of the national park paper from the Denali Visitor Center and check for park alerts, to better plan your visit. Know your limits; do not attempt a hike that is beyond your capabilities but have a plan if you or one of your party becomes unwell. Have you road tripped through Denali National Park? If you’ve road tripped through Denali National Park, do you have any tips to share? Perhaps you are planning a trip yourself – I’d love to hear!